BT should be given no more taxpayers' money to roll out rural broadband until it clarifies how it is spending the £1.2bn already paid to it, the Commons Public Accounts Committee has said. Government audits of how much the telecoms firm charged councils for project management have revealed possible savings of up to 35%. 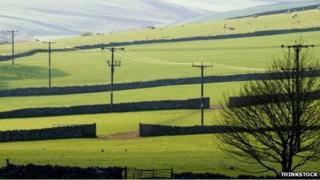 BT has so far won all the UK's rural broadband contracts. The firm said any savings would go on extending coverage. "Yes, it's true that BT has been able to save the taxpayer some project management costs," the telecoms firm told the BBC. In response to the news, the Public Accounts Committee (PAC) told the BBC that BT should not yet be allowed to bid for the next round of broadband funding - a pot of £250m which the government has this week distributed to councils to get fast broadband to their most hard-to-reach communities. "It appears with this £250m that local bodies can simply decide to extend contracts with BT where they are in place. This is just not good enough," a PAC spokeswoman told the BBC. "We want to see clearly what the economies-of-scale savings for the first tranche of £1.2bn will be before contracts are extended or competed." But the Department for Culture, Media and Sport told the BBC it would not be intervening in the process. "Procurement will be a local decision - we're not dictating who the supplier should be," it said. The tale of how fast broadband - defined by the EU as speeds of 24Mbps or above - is getting out to the most rural communities in Britain - has not always been a happy one. Many such communities are still struggling on very low broadband speeds and have become increasingly frustrated about how long it has taken to rectify that in an age when reliable broadband speeds have become a near necessity for many. The government has pledged that 95% of the UK will have superfast broadband by 2017, a figure some experts have questioned. The process to make that happen has also come in for a great deal of criticism. Initially there were long delays in distributing the money and, when councils did eventually receive their share of the central government subsidy, it was unclear how they should spend it. With little technical expertise within councils and few bidders - Fujitsu and a handful of other operators having pulled out of the process at an early stage - all eventually chose BT to handle the rollouts. Councils added their own funding to the amount already offered by central government. In the autumn, the PAC scrutinised the process and concluded that taxpayers had been "ripped off" and the government had "mismanaged" the project by allowing BT to win all the council bids. The PAC also said that BT had exploited its "quasi-monopoly position" in the way it bid for the contracts. Since then it seems that the DCMS and BDUK - the group charged with overseeing the rollout - have been keeping a close eye on how BT spends the money. DCMS has told councils that they must get detailed lists from BT, explaining exactly how many people will be deployed to project-manage broadband rollout. BT will only be able to invoice local councils for these staff. "This process has led to the cost savings being identified in relation to the project management costs in the bids," a DCMS spokesman told the BBC. According to a senior civil servant, this part of BT's current bill could be reduced by up to 35%. BT promised any savings would be reinvested into making rural broadband even more widely available. It said it will take 15 years for it to make a profit on rural broadband rollout. It also insists it has been fully transparent about its costs, submitting detailed breakdowns to BDUK. Despite this it was unable to tell the BBC what proportion of the £1.2bn it has won would go on project management and how much would be spent on laying and installing fibre in telephone cabinets. The amount it is charging councils for installing fibre in their network of telephone cabinets has also been questioned. In September Mike Kiely, a former senior manager at BT, said that there was "no justification" for the amount BT was suggesting it would need to bring broadband to rural communities.